NXP's Arm-based portfolio offers the highest level of integration and the broadest range of performance. Our development tools provide comprehensive support for NXP device families in a complete development environment for creating, debugging and verifying embedded applications. While MDK supports all Arm Cortex-M microcontroller devices, DS-MDK adds support for heterogeneous (Arm Cortex-A and Cortex-M based) systems and catalog Arm Cortex-A devices. 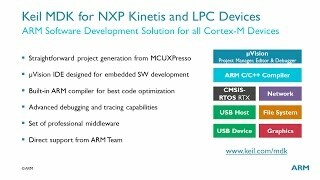 NXP's MCUXpresso is a powerful set of tools which enables users to generate an SDK that can be used with Keil MDK. In this video, you will learn how to use it together with Keil MDK to set up and maintain projects for the NXP LPC and Kinetis microcontroller families. Keil development tools provide comprehensive support for NXP device families in a complete development environment for creating, debugging and verifying embedded applications. For a list of supported ARM7/ARM9 devices, please visit the legacy device database. These devices are fully supported by MDK Version 5 using the Legacy Pack. 8051-based devices are fully supported by Keil C51 Development Tools. For a list of supported 8051 devices, please visit the legacy device database.